Creativity also embraces all the disappointments and frustrations on the road to a new way of doing things. They are part of the process. Imagine: How Creativity Works by Jonah Lehrer (Houghton Mifflin Harcourt, 2012) takes a look at creativity from, I think, an unorthodox perspective. And his analysis is brilliant. He turns some assumptions about the creative process on their collective heads. The biggest takeaway for me was simply that we all have the ability to be creative—and it takes persistence. In other words, you gotta work for it! Creativity is a product of persistence and effort (lots of it). Focus? While attention and focus are important, Lehrer tells us that “Occasionally, focus can backfire and make us fixated on the wrong answers.” Insight has a better chance of occurring only after you relax. 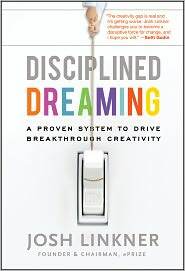 Daydreaming can inspire innovation. But we have to maintain enough awareness to know when we are having a creative thought. That is the rub! Drifting is easy…noticing, tougher. The color blue stimulates mental relaxation and nurtures creativity. Collaboration. Innovation flourishes in a “culture of collaboration.” Innovations are more likely when outsiders are brought in. Avoid the temptation to work only with friends and known entities. That will limit you. Do whatever you can to encourage interaction. If you stay with the same people, you end up doing the same thing. Brainstorming? Lehrer cites research studies that proclaim brainstorming is less effective than people working alone and then sharing ideas. Criticism is actually very important in the creative process. We need to have candid discussions. Pixar uses a strategy called “plussing.” Any criticism that is given must also present a plus or new idea that builds on the original idea. Urban friction. The diversity and expanse of urban populations create opportunities for innovation and creativity. Education. Rote learning is the antithesis of the creative process. Effort. “Nobody is talented enough to not have to work hard, and that’s what grit allows you to do…grit allows you to take advantage of your potential.” Angela Duckworth, psychologist (University of Pennsylvania). 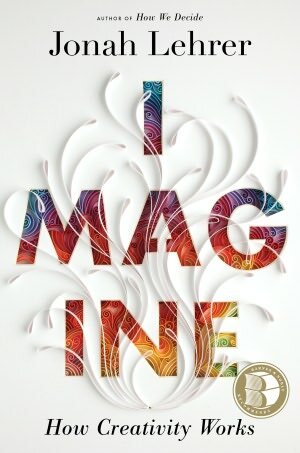 Imagine reminded me that creativity is more than that moment of insight and exhilaration. Creativity also embraces all the disappointments and frustrations on the road to a new way of doing things. They are part of the process. But how many people quit and never enjoy the result? When i was young, i was always underrated by other kids. They would underestimate me because i was shy and kind of clumsy; but i had some great ideas. For example: my senior year, i was the chaplain. i was known for my unique prayers and unusual style; but i was criticized and told that my prayer would be written for graduation day. Can you believe that? how can you rehearse something from the heart. so my creativity(or in this case freedom) was taken and controlled for their amusement. My life lesson was that people mostly destroy creativity because they lack their own. I have read creativity and I totally agree with what I read, but I will like to say that the emphasis is not just work but the time and effort as well. Other than being called “white girl”, by some of my closest black friends, eccentric, weird, and different were other choice words they had for me. Although I was once offended by those words, I no longer am because I now know that being different, or creative, is actually a compliment. It means to me that someone is taking notice of my gift of creativity. I love your comment about creativity embracing frustrations and disappointments. I’ve never heard of it said quite like that before, but I definitely agree. Stand out in a positive way–be indispensable!